Thanks to our 100% satisfaction warranty for do-it-yourself users, if a customer is unhappy with their Clog Hog sewer jetter we’re likely to hear about it. The good news is that only a very small percentage of Clog Hog products are ever returned for a refund. It’s rare for owners of gas-powered pressure washers to return their sewer jetters, even though they’re by far the largest group of customers. Historically far below 1% of gas-powered pressure washer owners have returned their Clog Hog drain cleaners. Electric pressure washer owners return their drain cleaners far more frequently. Nearly 1 in 20 electric pressure washer owners (or almost 5%) return their sewer jetter for a refund. Several who received refunds told us that they were unable to reach the problem area in the drain when powering their jetter with their electric pressure washer. You should know that while it’s possible to get effective drain cleaning using a good-quality electric pressure washer (especially a unit rated 1.5 GPM or above), electric machines’ lower GPM and PSI ratings simply deliver less pulling and cleaning power. 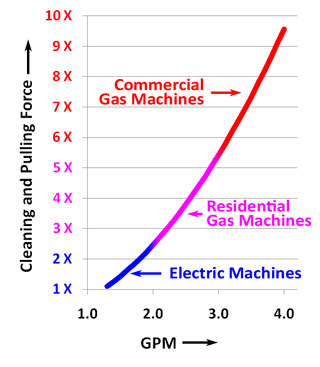 Nozzle force equations tell us that a typical electric-powered pressure washer is likely to give you one-third the pulling and cleaning force compared to the lowest-cost gas-powered machine. That’s a big difference, and it’s the reason why switching to a gas-powered machine can improve your odds of a successful drain cleaning job. We understand that many customers prefer to try sewer jetting first with a less expensive electric machine before they consider borrowing, renting, or investing $300 or more to buy a gasoline-powered unit. Fortunately Clog Hog sewer jetters are upgradeable. You can contact our customer service team for help to purchase the right Adapter Kit for your machine. All it takes is your original Clog Hog sewer jetter, the right Adapter Kit, and a pair of adjustable wrenches.